If you want to add a touch of rustic charm to your home, there’s no better way to do it than by upcycling or refinishing a piece of furniture with milk paint. To us, rustic style encompasses a laid-back look with warm, natural materials, weathered or distressed wood and a creative, do-it-yourself attitude. Learning how to make something look rustic is a fantastic way to give secondhand pieces new life and turn generic finds — like those you might score on sale at a big box store — into one-of-a-kind masterpieces. Rustic painting may look artistic once finished, but the process itself is easy enough for complete beginners. Success depends on just three things: the right equipment, the right process and the right attitude. Milk paint in two different colors. Choose an underlying color and a top color. The underlying color will be exposed slightly on “worn out” areas. For an eye-catching, vibrant look, choose contrasting colors (for example, salmon and moss green for a touch of country chic or fuchsia and turquoise for a bohemian-meets-modern effect), or opt for two colors in the same family (like Blue Spruce and Beachgrass) for a subtler result. Learning how to paint rustic furniture is part intuition, part practice. Luckily, we have tips straight from our in-house experts, so you can turn your passion project into something worthy of display — or even resale. Apply one coat of your underlying color. It’s important to paint following the grain. Painting against the grain creates noticeable brush strokes that will become even more apparent once you start distressing your piece to create dimension. Let dry for about two hours. Lightly sand the dried paint. Apply a light second coat of the underlying color, then let it dry overnight to harden. Apply one coat of the top color and let dry overnight. If you try to paint the underlying color and the top color on the same day, the colors may get muddled. Once you have your piece of furniture completely painted, you can begin distressing it. Wet your rag in a bucket of water and wring it out completely so that it is just damp. Rub the rag over areas you’d like to distress. Some natural areas that would have wear and tear are the bottom edges, sides and anywhere that hands would come into contact with the finish, such as near handles. You’ll notice that the color comes off slightly from rubbing with a damp rag for a more delicate effect. If you would like a more overtly distressed look, use sandpaper. Once you’ve finished distressing your piece, use a low-sheen burnishing paste to add a protective layer and make the piece easier to wash and clean. This is an acrylic paste that slightly darkens the color but is an easy finishing solution to your distressed piece. Brush on the burnishing paste to completely cover your furniture. Work in natural light. Too little light and you can easily end up over-distressing your piece, and it’ll look beat up and unsightly. Too much light and you won’t have an accurate picture of what the piece would look like in a normal indoor setting. Go slowly. The best distressing is done in layers. Add a scuff here, rub a bit of paint off there, and then reevaluate. You can always distress your project further, but undoing your efforts requires repainting, and that’s not a cycle you want to get into. Focus on the big picture. As you distress, keep stepping back to look at your project piece as a whole. You want to see how all the marks work together to create a cohesive whole. Balance is important; vintage furniture doesn’t get worn down on one side and stay nearly pristine on the other, but don’t get bogged down in symmetry either. Use a combination of the wet rag method and sanding, or at least play around with both. Sanding can be harder to control, but you’ll strip the paint quicker and be able to go deeper. On the other hand, using the rag allows for greater finesse. Find the beauty in the imperfections. There’s no better time to embrace mistakes than when you’re playing with paint and distressing. If you have an oops moment, roll with it. You may end up loving the results. Voila! 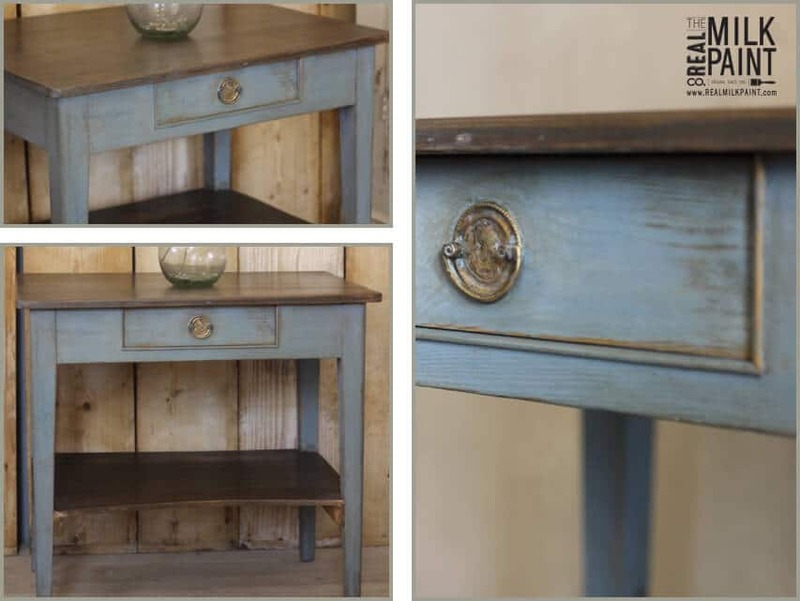 A few key tools, a bit of advice and a decent amount of elbow grease and you’ve created a one-of-a-kind piece of distressed furniture that adds character and charm to your home. Now, what will your next project be? 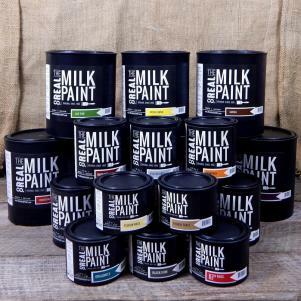 For more information and a step-by-step visual guide on how to make paint look rustic, check out our video tutorial on how to distress furniture using Real Milk Paint.